The Grand National aside, it’s hard to think of a more highly anticipated race than the Cheltenham Gold Cup. This grade 1 National Hunt race, run over a distance of 3 miles 2 1/2 furlongs (with 22 fences) at Cheltenham racecourse is for 5 year olds and up. It has a sizeable purse of £575,000, with over £325,000 going to the winner,making it the most valuable non handicap chase in the country. The race is part of the prestigeous Cheltenham Festival, with the Gold Cup taking place on the final day of the Festival. Jockey, trainers and owners frequently set their sights on the Cheltenham Festival due to its reputation as the Blue Riband event of jump racing. Previous winners have included a who’s who of racing greats including Arkle (three years running from 1964 to 1966), L’Escargot (in 1970 and 1971), Desert Orchid (1989), Master Oats (1995), Best Mate (2003, 2004, 2005) and Kauto Star (2007 and 2009). 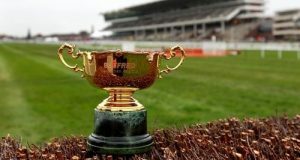 The first Cheltenham Gold Cup took place in 1819 and Spectre won the race picking up a 100 guineas prize in the process. At the time the event was actually a flat race, and it wasnt until 1924 that the race was held over the jumps. Moving from the old to the new course in 1959 the race was dominated in the mid 60’s by the aforementioned Arkle, one of the now legends of the sport of racing. The starting price (SP) of his third and final win was an incredibly short 1/10, which speaks to his perceived, and actual, superiority. To this day, he’s still the shortest odds winner of the race. The longest odds being the 100-1 offered on the 1990 winner Norton’s Coin. Over the years the Gold Cup has had many others memorable moments, such as in 2015 when Coneygree became the first novice to win the race in 40 years, and Kauto Star becoming the first ever horse to ‘regain’ the Cheltenham Gold Cup title with wins in 2007 and 2009. Winner of the 2018 Cheltenham Gold Cup was fancied 5-1 shot Native River, with Richard Johnson on board and trained by Colin Tizzard. The Irish bred, british trained thoroughbred is also a winner of the Hennessy Gold Cup, Welsh Grand National and Denman Chase (x2).